Telangana is one of the 29 states in India, located in southern India. Formed on 2 June 2014 as the youngest state in India, from the northwestern part of the Joint State of Andhra Pradesh, Telangana has an area of 112,077 square kilometres (43,273 sq mi), and a population of 35,193,978 (2011 census). It is the twelfth largest state in India, and the twelfth most populated state in India. Its major cities include Hyderabad, Warangal, Nizamabad and Khammam. 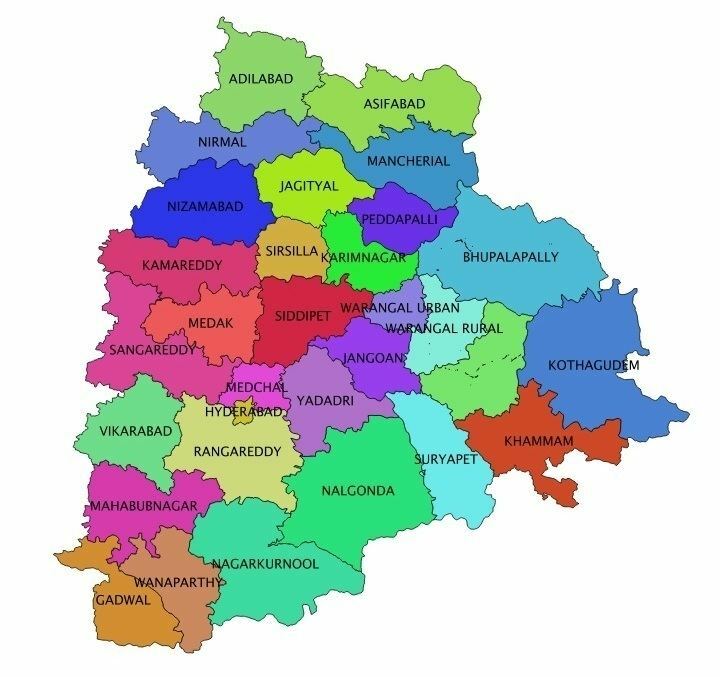 Telangana is bordered by the states of Maharashtra to the north and north west, Chhattisgarh to the north, Karnataka to the west and Andhra Pradesh to the east and south. According to Kingshuk Nag who authored "Battleground Telangana" (2011); Etymology of Telangana is uncertain; it is believed that the word Telugu is derived from Telu in Gondi language-A dialact spoken by the tribals of Chhattisgarh—(in present-day a state located in North of Telangana), and plural form of Telu is Telunga which means "white skinned people", and thus making the word Telangana. According to Campbell, Alexander Duncan (1789–1857); who authored a book "A Grammar of the Teloogoo language" (1816) mentions that; A theory suggest that the name Telangana is derived from the word Trilinga (Sanskrit: त्रिलिङ्ग), as in the Trilinga Desa, which translates to "the country of the three lingas". According to a Hindu legend, Shiva descended in the lingam form on three mountains, Kaleshwaram, Srisailam and Draksharama, which marked the boundaries of the Trilingadesa (Sanskrit: त्रिलिङ्गदेश), later called Telinga, Telunga or Telugu. Telangana was governed by many rulers, including the Satavahana dynasty (230 BCE to 220 CE), the Kakatiya Dynasty (1083–1323), the Musunuri Nayaks (1326–1356) the Delhi Sultanate, the Bahmani Sultanate (1347–1512), Qutb Shahi dynasty (1512–1687), Mughal Empire (1687–1724) and Asaf Jahi Dynasty (1724–1948). The Telangana area experienced its golden age during the reign of the Kakatiya dynasty, which ruled most parts of the present day Andhra Pradesh and Telangana from 1083 to 1323 CE. Rudrama Devi and Prataparudra II were prominent rulers from the Kakatiya dynasty. The dynasty weakened with the attack of Malik Kafur in 1309 and was dissolved after the defeat of Prataparudra by the forces of Muhammad bin Tughluq in 1323. In 1952, Dr. Burgula Ramakrishna Rao was elected chief minister of the Hyderabad State in its first democratic election. During this time, there were violent agitations by some Telanganites to send the Madras state bureaucrats back and implement a rule by the natives (mulkis) of Hyderabad. There have been several movements to revoke the merger of Telangana and Andhra, major ones occurring in 1969, 1972 and 2009. The movement for a new state of Telangana gained momentum in the 21st century by an initiative of Kalvakuntla Chandrashekar Rao, the chief of Telangana Rashtra Samithi, on 29 November 2009. On 9 December 2009 the Government of India announced the process of formation of the Telangana state. Violent protests led by people in the Coastal Andhra and Rayalseema regions occurred immediately after the announcement, and the decision was put on hold on 23 December 2009. Telangana is situated on the Deccan Plateau, in the central stretch of the eastern seaboard of the Indian Peninsula. It covers 114,840 square kilometres (44,340 sq mi). The region is drained by two major rivers, with about 79% of the Godavari River catchment area and about 69% of the Krishna River catchment area, but most of the land is arid. Telangana is also drained by several minor rivers such as the Bhima, the Maner, the Manjira and the Musi. The annual rainfall is between 900 and 1500 mm in northern Telangana and 700 to 900 mm in southern Telangana, from the southwest monsoons. 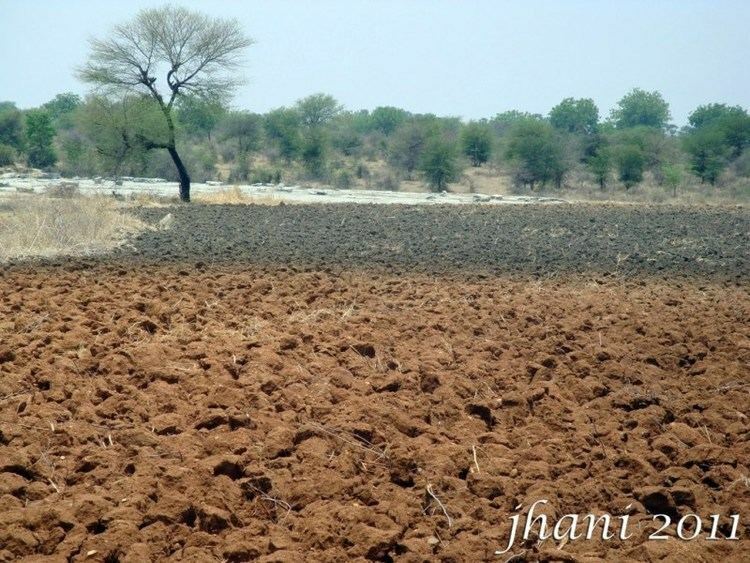 Various soil types abound, including chalkas, red sandy soils, dubbas, deep red loamy soils, and very deep black cotton soils that facilitate planting mangoes, oranges and flowers. Sacred groves are small areas of forest preserved by local people. Sacred groves provide sanctuary to the local flora and fauna. Some are included within other protected areas, like Kadalivanam in Nagarjunsagar-Srisailam Tiger Reserve, but most stand alone. 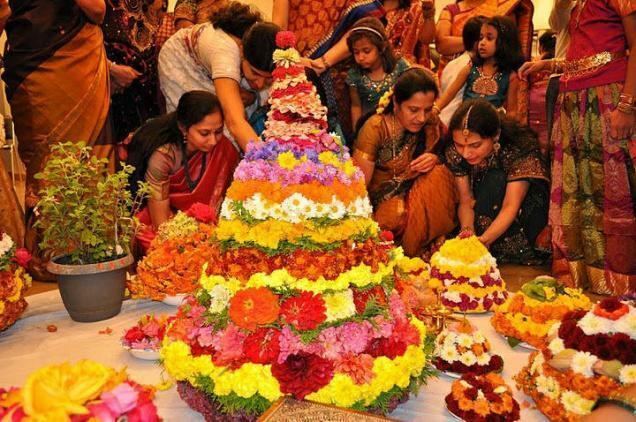 There are 65 sacred groves Telangana – two in Adilabad district, thirteen in Hyderabad district, four in Karimnagar district, four in Khammam district, nine in Mahbubnagar district, four in Medak district, nine in Nalgonda district, ten in Ranga Reddy district, and three in Warangal district. The state is divided into 31 districts which are further divided into 68 revenue divisions and they are in turn divided into 584 mandals. There are a total of 12 cities which include, 6 municipal corporations and 38 municipalities. Hyderabad is the only million plus city in the state. Telangana is governed through a parliamentary system of representative democracy, a feature the state shares with other Indian states. Universal suffrage is granted to residents. There are three branches of government. The legislature, the Telangana Legislative Assembly and the Telangana Legislative Council, consists of elected members and special office bearers such as the Speaker and Deputy Speaker, that are elected by the members. Assembly meetings are presided over by the Speaker or the Deputy Speaker in the Speaker's absence. The Assembly is bicameral with 119 Members of the Legislative Assembly and 40 Member of the Legislative Council. Terms of office run for 5 years, unless the Assembly is dissolved prior to the completion of the term. The Legislative Council is a permanent body with one-third members retiring every two years. The main players in the regional politics are the Telangana Rashtra Samithi, All India Majlis-e-Ittehadul Muslimeen, Telugu Desam Party, Bharatiya Janata Party and Indian National Congress. Following the Telangana Legislative Assembly Election in 2014, the Telangana Rashtra Samithi under Kalvakuntla Chandrashekar Rao was elected to power. Telugu and Urdu are the official languages of Telangana. About 77% of the population of Telangana speak Telugu, 12% speak Urdu, and 13% speak other languages. Before 1948, Urdu was the official language of Hyderabad State, and due to a lack of Telugu-language educational institutions, Urdu was the language of the educated elite of Telangana. After 1948, once Hyderabad State joined the new Republic of India, Telugu became the language of government, and as Telugu was introduced as the medium of instruction in schools and colleges, the use of Urdu among non-Muslims decreased. The Urdu spoken in Telangana is called Hyderabadi Urdu, which in itself is a dialect of the larger Dakhini Urdu dialects of South India. Although the language is orally spoken by most Hyderabadi Muslims, the language in a literary context has long been lost, and standard Urdu is used. According to the 2011 census, Telangana's literacy rate is 66.46%. Male literacy and female literacy are 74.95% and 57.92% respectively. Hyderabad district leading with 80.96% and Mahabubnagar district at the bottom with 56.06%. The state has also started to focus on the fields of information technology and biotechnology. Telangana is one of top IT exporting states of India. There are 68 Special Economic Zones in the state. Rice is major food crop and staple food of the state. Other important crops are maize, tobacco, mango, cotton and sugar cane. Agriculture has been the chief source of income for the state's economy. Important rivers of India, the Godavari, Krishna flow through the state, providing irrigation. Apart from major rivers, there are small rivers as Tunga Bhadra, Bima, Dindi, Kinnerasani, Manjeera, Manair, Penganga, Pranahitha, peddavagu and Taliperu.There are many multi-state irrigation projects in development, including Godavari River Basin Irrigation Projects and Nagarjuna Sagar Dam, the world's highest masonry dam. Several major manufacturing and services industries are in operation mainly around Hyderabad. Automobiles and auto components industry, spices, mines and minerals, textiles and apparels, pharmaceutical, horticulture, poultry farming are the main industries in Telangana. In terms of services, Hyderabad is usually nicknamed as Cyberabad due to its information technology foray and location of major software industries in the city. Prior to secession, it contributed 10% to India's and 98% to Andhra Pradesh's exports in IT and ITES sectors last 2013 With Hyderabad as in the front line of Telangana's aims to promote information technology in India, the city boasts the HITEC City as its premier hub. The state government is in the process of developing Industrial Parks at different places, for specific groups of industries. The existing parks are Software Park at Hyderabad, HITEC City for software units, Apparel Park at Gundlapochampalli, Export Promotion Park at Pashamylaram, Bio-technology park at Turkapally. Hyderabad is also a major site for healthcare related industries including hospitals and pharmaceutical organizations such as Nizam's Institute of Medical Sciences, Yashoda Hospitals, LV Prasad Eye Care, Akruti Institute of cosmetic and plastic surgery, Fever Hospital, Durgabai Deshmukh, Continental Hospitals and Apollo Hospitals. Many pharma and pharma related companies like Dr. Reddy's Laboratories, Shantha Biotechnics and GVK BIO are based out of Hyderabad. In addition, Hyderabad based healthcare non-profits include the Indian Heart Association, a cardiovascular disease NGO. Telangana state has won CNBC-TV18 Promising State of the Year Award for the year of 2015. The Jury for the India Business Leader Awards (IBLA) has collectively chosen Telangana for the award. Hydel and thermal power projects in the state meets the power requirements of the State. Number of new power projects are coming up in the State which is expected to generate additional power capacity in the state. The state is well connected with other states by means of road, rail and airways. The Telangana State Road Transport Corporation (TSRTC) is the major public transport corporation that connects all the cities and villages. Mahatma Gandhi Bus Station (M.G.B.S) in Hyderabad is one of the largest bus stand in Asia. Jubilee Bus Station in Secunderabad serves inter city bus services. Asia's biggest Inter City Bus Terminal (ICBT) is being built in Miyapur (Hyderabad), which would house nearly 200 bus bays and for parking nearly 1,000 buses. The history of railways in this region dates back to the time of nizam of Hyderabad in 1874. It operates under the auspices of the South Central Railway founded in 1966. The landmark building Rail Nilayam in Secunderabad is the Zonal Headquarter office of South Central Railway. Secunderabad and Hyderabad are the main divisions of South Central Railway that fall in the state. Rajiv Gandhi International Airport at Shamshabad is an international airport serving the city of Hyderabad. It is the largest airport in the state and one of the busiest airports in the country. The government has plans to upgrade Warangal Airport, Nizamabad Airport and Ramagundam Airport It also plans to construct airports in Karimnagar and Kothagudem. Warangal has a domestic airport in Mamunooru which was established in the year 1930 during Nizam period. All the exports and imports of Azam Jahi Mills, Warangal were done through the Warangal Airport. Telangana culture combines cultural customs from Persian traditions, embedded during rule of the region by the Moghuls, Qutub Shahis and Nizams, with prominent and predominantly south Indian traditions and customs. The State has a rich tradition in classical music, painting and folk arts such as Burra katha, shadow puppet show, and perini Shiva Tandavam, Gusadi Dance, Kolatam. There are religious worship centers of different religions in the state. These include Muslim worship destinatoins such as Makkah Masjid near Charminar, Khairtabad Mosque, Koh-e-qaim, Mian Mishk Masjid, Toli Masjid and Spanish Mosque. Telugu cinema, also known by its sobriquet as Tollywood, is a part of Indian cinema producing films in the Telugu language, and is centered in the Hyderabad, Telangana neighbourhood of Film Nagar. In the early 1990s, the Telugu film industry had largely shifted from Chennai to Hyderabad. The Telugu film industry is the second-largest film industry in India next to Bollywood Film Industry. In the years 2005, 2006 and 2008 the Telugu film industry produced the largest number of films in India, exceeding the number of films produced in Bollywood. The industry holds the Guinness World Record for the largest film production facility in the world. 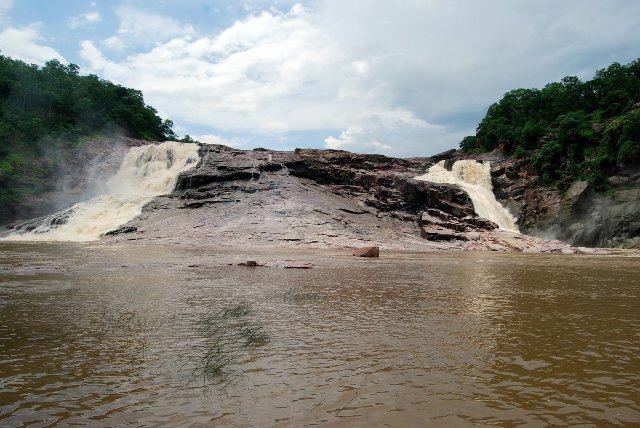 Kuntala Waterfall [45 metres (148 ft)] located in Kuntala, Adilabad district, is the highest waterfall in the state. Bogatha Waterfall is waterfall located in Koyaveerapuram G, Wazeedu Mandal, Bhupalpally district, Telangana. It is located 120 km from Bhadrachalam, 140 km away from Warangal and 329 km from Hyderabad. Savatula Gundam Waterfalls are one of the many waterfalls located in Adilabad district, Telangana, India. They are located 30 kilometres (19 mi) from Asifabad and 350 kilometres (220 mi) from Hyderabad, the state capital. Gowri Gundaala waterfalls at sabitham village near Ramagundam in Peddapalli district. The Government has established Rajiv Gandhi University of Knowledge Technologies Basar(RGUKT Basar) in 2008 to cater to the educational needs of the gifted rural youth of Telangana. The higher education includes many colleges, universities and research institutes providing professional education in the fields of arts, humanities, science, engineering, law, medicine, business, and veterinary sciences, with undergraduate and post graduation. The Hyderabad cricket team is represented in the Ranji Trophy and had won twice. The Rajiv Gandhi International Cricket Stadium is the home ground of Hyderabad cricket team. It hosts international as well as domestic matches. The Sunrisers Hyderabad, an Indian Premier League franchise, is based in Hyderabad. Notable sports persons from the state are Mohammad Azharuddin, V. V. S. Laxman, Mithali Raj, Pragyan Ojha, Saina Nehwal, P.V. Sindhu, Jwala Gutta, Parupalli Kashyap, Gagan Narang, Mukesh Kumar and Pullela Gopichand, as well as Sania Mirza who has been appointed as the "brand ambassador" of Telangana. Other stadiums include Gachibowli Athletic Stadium, LB stadium and G. M. C. Balayogi Athletic Stadium.